1. Read the first two lines of the first paragraph. Note what the topic is and what the author is writing about it. 2. Read the first line of each body paragraph. Again, note what the topic is and why the author introduces it. 3. Read the first and last line of the final paragraph. Pay particular attention to how the author ends the passage. 4. Look back at your notes. What's the common idea? Is the author presenting facts? Examining different views? Answering questions? 1. After a seven-year journey, the Cassini spacecraft approached the planet Saturn in June 2004. The spacecraft's successful entry into orbit around the world represented the culmination of a vision that took more than 20 years to realize. Launched amid controversy in October 1997, the Cassini spacecraft traveled more than one billion miles in its journey. Now scientists eagerly await the fruits of their labor. 2. The Cassini mission resulted from the joint efforts of NASA (National Aeronautics and Space Administration), the European Space Agency, and the Italian Space Agency. 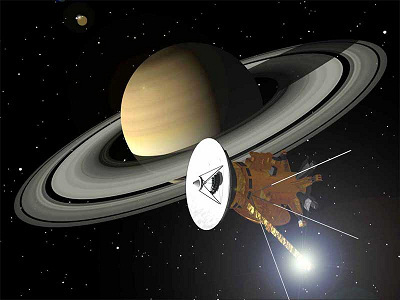 The Cassini spacecraft actually consists of two parts; the first is the Cassini orbiter itself, designed to explore the moons, rings, and atmosphere of Saturn. The second is the Huygens probe. Named after Christiaan Huygens, the discoverer of Saturn's rings, the Huygens probe will plunge into the atmosphere of Saturn's largest moon, Titan. Hundreds of engineers and scientists from more than 30 countries contributed to the Cassini-Huygens project. 3.Mission designers set highly ambitious goals for the project. After Cassini reached Saturn, scientists hoped the craft would help provide answers to some great astronomical mysteries. Most intriguing to many scientists was the nature of Saturn's awesome ring system. Other scientists hoped to learn the composition and geological features of some of Saturn's many moons. And not a few scientists waited eagerly for information on Titan, the only known moon with an atmosphere. Some believe that Titan has a chemical composition resembling that of early Earth and so it may hold important clues about Earth's formation. 4. The Cassini spacecraft itself is a marvel of engineering. Measuring 22 feet high and 13 feet wide, the Cassini orbiter weighs more than 4,000 pounds. With the Huygens probe attached and fuel added, the total weight of the craft is more than 12,000 pounds. The orbiter holds a variety of scientific instruments, including a cosmic dust analyzer, a magnetometer, and infrared and ultraviolet cameras. All told, the craft has 18 different scientific instruments designed to carry out 27 different scientific experiments. 5. One of the greatest challenges faced by engineers working on the Cassini project involved getting the spacecraft to Saturn. Saturn lies almost 800 million miles away from Earth, an immense distance. The amount of fuel needed to send Cassini on a direct route to the planet would be prohibitive. Therefore, mission strategists had to come up with a plan to get the craft to Saturn using a minimum amount. The solution was to use a technique called gravity assist, in which the craft uses the gravitational pull of a planet to "slingshot" it into deep space. Mission planners sent Cassini on a route that passed by the planet Venus twice and back toward Earth for a final push. This circuitous route added more than 200 million miles to the craft's journey. 6. Another challenge to the Cassini mission came from a most unexpected source. Because of Saturn's great distance from the Sun, solar panels would not be able to provide sufficient energy to power the orbiter. To solve this problem, engineers decided to use nuclear power, placing a 72-pound chunk of plutonium in the craft. This strategy immediately incurred criticism from environmentalists and others who were worried that, were an accident to occur, the radioactive material could harm people on Earth. 7. Fortunately, the launch of Cassini went off without a problem. For seven years, the spacecraft traveled through the void of space. Upon reaching Saturn, Cassini's instruments awoke from their long slumber and began transmitting data. Yet the mission is not over. On Earth, scientists now begin the long task of analyzing all the new information they've received, hoping for answers to the mysteries of the solar system. The purpose of this passage is .